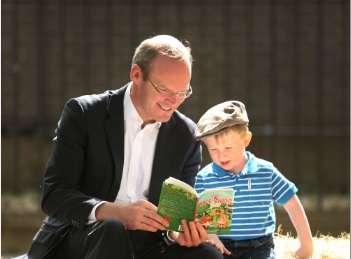 Minister Simon Coveney with Eamon Delaney, son of Agrikids founder Alma Jordan. 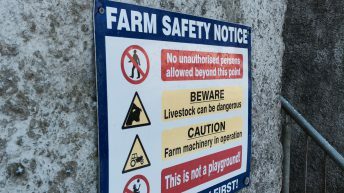 Extra vigilance is needed when it comes to farm safety in rural areas as farming activities intensify over the summer, according to Minister for Agriculture Simon Coveney. The Minister was speaking at the launch of a series of children’s story books written by Alma Jordan from Co. Meath. Jordan is also the founder of Agrikids, an initiative designed to promote the positives of rural life while educating children on the hazards that exist in our farmyards and countryside. Farming continues to be the most dangerous occupation in Ireland with statistics from 2014 showing it almost four times more dangerous than the construction industry. In 2014, there were 30 deaths on farms, five of which were children. The next most dangerous occupation was construction, which recorded eight deaths. Tractors and machinery are responsible for almost half (49%) of all farm deaths in past 10 years, and 68% of childrens farm deaths. Speaking at the launch of the ‘Tales from Riverside Farm’ children’s storybook series, Minister Simon Coveney, TD, said that summer is an incredibly busy, and high-pressure, time on Irish farms with farmers taking advantage of the brighter evenings and more favourable weather to maximise their output. “The weather this May was particularly bad, and so our farmers have been playing catch-up since with silage, in particular, but also hay making now ramping up. 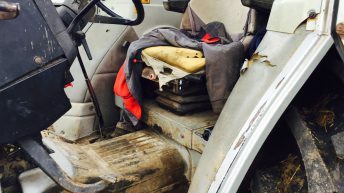 “This means this is the peak period of the year with machinery use across the country and given the rate of machinery related accidents, it’s the time for greater vigilance than ever. In the last 10 years, tractors and machinery have been responsible for almost half of all farm deaths and three-quarters of children’s farm deaths and so it is crucial that our rural communities are keenly aware of the potential for accidents in this busy farming period. “This initiative by Alma Jordan is a very welcome one as children who read these books will be educated about the importance of farm safety and the risks that are out there. Jordan founded Agrikids in January 2015 after being hugely affected by the surge in farm deaths in 2014. She took it upon herself to play a role in raising awareness of the need for greater farm safety by developing the series of books. Jordan said that the one key phrase that emerged from the tragedies of 2014 was that ‘farmyards are not playgrounds’. “I feel so strongly that we need to share the burden of responsibility for farm safety and work on a strategy of collaboration. “Current advertising practices are being directed solely to farmers but I believe that by empowering children through education and engagement we are also educating the adults,” she said.